We are having a truly sunny spell at the moment. With temperature hitting low 20s°C for the next few days, it is unsurprising that everyone is out having (or currently planning) picnics, and across River Seine, Pont des Arts is quite the perfect spot. Even I was drawn to go over there quickly today, albeit only to take a few photos before heading to a friend’s for girls night in. If you’re walking the bridge that has long been touted as lovers’ bridge, you’ll see padlocks all across the length of the bridge on both sides of the railings. The whole idea would be for couples to affirm the bond of their love to each other, represented by the lock, with the key thrown into the river, lost to seekers (and therefore those sought to break this hold). However, the romantic that I am (not), I can’t help but wonder, what happen when love turns suffocating, as if an imprisonment, to which one party could not escape the other? And the symbolism of being under lock and key, does that stand for playing the role of somebody’s love slave? What do you think? 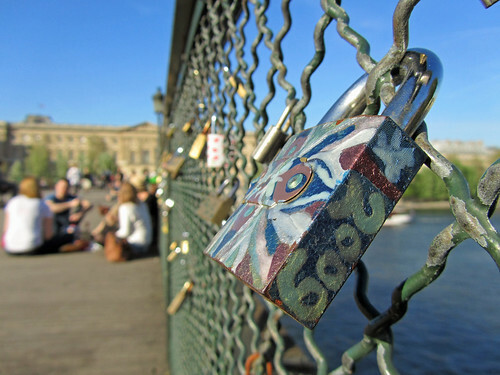 Would you put a lock on Pont des Arts if given a chance to?